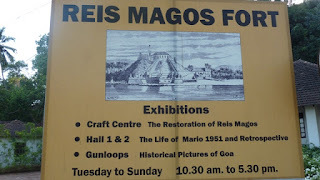 Reis Magos fort is situated in Reis Magos village which is located on the northern bank of the Mandovi River and that also happens to be right across the city of Panaji. This fort is also visible from the Panaji side. The Mandovi river has always been the point of entry into the city of Goa. Hence for the sake of protection four major forts at its mouth where built & they are Aguada, Reis Magos, Cabo and Gasper Dias. This Reis Magos fort was constructed using laterite & is located on a hill, can be accessed through a ramp or a narrow staircase. Originally it was an armed outpost built by the Adil Shah in the late 1400 and got destroyed in 1500. It was rebuilt but it could not hold on to its position and hence it was transformed into a jail finally it was abandoned in 1900 after which it begun to crumble. From the fort one can obtain a beautiful view of the River Mandovi. The other features of the fort are the high sloping walls, underground rooms, passages, cylindrical turrets looking out towards the Mandovi & The water supply provided to d fort from a fresh water spring which is situated within the fort. Restoration Work on the fort begun way back in 2008, now its open to the public. This place is not only used as a tourist spot but also is used as a cultural center where programs will be held, infact the very first free live music festival just took place there and I have to say the time just flew by for me. The link for it is available in the description box. The big rooms are not kept empty and feature an exhibition of works of noted late illustrator and cartoonist. Parking : Space is available at the foot of the hill. As I mentioned I had been to Goa for like 10 days on vacation. This Reis Mangos fort was one of the places that I checked out. Actually a music event was happening in the fort, so the entry was free. Reached the place at about 3pm I guess and left at 12pm :). Had fun in the fort listening to the music and checking out the fort. It was so beautiful in the night especially with all the lights and the climate was perfect. I hope you like this :D..
Have you been here?...Do share your views with me..Thank you so much for watching my video :D.. Your support means a lot to me :)).. Please don't forget to like,share and comment..